Send text messages and control your phone directly from your desktop computer or tablet web browser ! Hey Android WebControl users ! It’s been a little while but a new Android WebControl update 2.5.0 is available on Google Play. This version brings a lot of features that have been asked by the community for a while. Thank you for you support ! [FIX] The contacts window will now only list contacts with phone numbers. A new Android WebControl update 2.4.0 is available on Google Play. This version brings HTTPS support and will protect your privacy by encrypting all communications. Just enable it in the preferences and don’t forget to add the ‘S’ in ‘HTTPS://’ when typing the URL to connect to Android WebControl. If you enable HTTPS your browser will warn you about the self signed certificate. No worries this is safe you can go ahead and accept the warning. [NEW] Server is automatically restarted when settings are changed. [NEW] Allow export of the call history to CSV. [FIX] Error when filtering the call history window. [FIX] Validate port number in the preferences. This is a tip to use Android WebControl to send your text messages programatically or using the command line. Replace host:port with the actual ip address and port shown by Android WebControl on your phone. The result should be a HTTP/1.1 200 OK and your message will be sent. This way you’ll be able to script the sending of text messages using the command line or interface Android WebControl with an another application. A new Android WebControl update 2.3.5 is available on Google Play. This is a bugfix release mainly to fix an annoying error receiving notifications with some Web browsers. Special Thanks to Pier for his help with this issue. [FIX] Notification error (TypeError) with some Web browsers. [FIX] Notification image for multiple contacts. 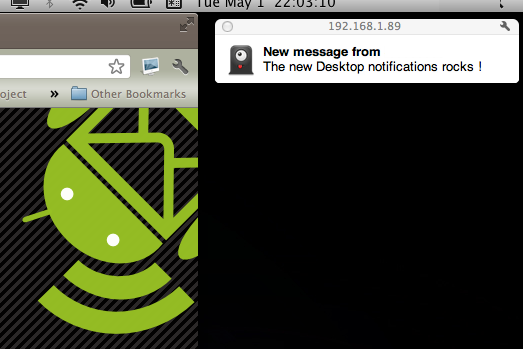 [NEW] Desktop notifications with supporting web browsers (like Google Chrome). [NEW] Display contact names and picture in notifications. [NEW] Allow to reply directly from a notification. [FIX] Error while listing some contacts on android ICS. [FIX] Date display in conversation list. Special thanks to Andrea for his help on fixing a few issues and also to the donators ! [NEW] Android 4.0 ICS support. [NEW] Added ‘Add’ and ‘Remove’ buttons to manage multiple recipients more easily when sending a text message. [NEW] CTRL+ENTER in the message box will now send the text message immediately. [FIX] Menu->Exit Button not working on all platforms. Android WebControl 2.3.0 Released ! Android WebControl 2.2.4 Released !